Impact of the Mead-Conway VLSI Design Methodology and of the MOSIS Service discussed in "Funding a Revolution"
The Mead-Conway VLSI systems work occurred in a complex context, and important part of which was the nature of government-university-industry collaboration and support for computer research during the late 70's and 80's. In the late 90's, the National Research Council sponsored work on a scholarly history of the development of computer technology during the 80's. 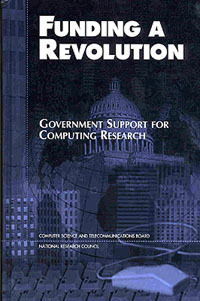 The results were published in 1999 in the book Funding a Revolution, which reveals how close government-university-industry interactions jointly supported rapid progress in new areas of computing, noting in particular the role of the Defense Advanced Research Projects Agency (DARPA) in these events. Chapter 4 excerpts provide more background on the Mead-Conway VLSI work. Box 4.4 contains a summary of the overall DARPA VLSI program results, and a discussion of Conway's MPC innovations that led to the MOSIS service. Table 4.2 summarizes important VLSI system architectures and CAD systems that built on the Mead-Conway methods. The Mead-Conway VLSI work and impact is used in this book as one of the key historical examples to clarify the complex multi-sector interactions. As a result, more of the Mead-Conway story is told in this book, as seen below. In addition, the book clarifies the historical computer infrastructural context in which the Mead and Conway work occurred, helping to clarify the nature of the opportunities for paradigmatic change that existed at the time of the VLSI work. Finally and importantly, the book clarifies the multidimensional DARPA role in stimulating and shaping important directions in technology, involving agency "talent scouting" to uncover exciting new talents in important areas of work, discovering important new results such as the Mead-Conway innovations, then funding early trial projects to probe and test the validity and significance of the work, and then massively funding a range of of projects to scale up the results. In this case, once the Mead-Conway innovations had been validated by operation of the MPC79 prototype system and the resulting VLSI design prototypes, DARPA began funding a wide range of VLSI architectural and CAD research programs, and also institutionalized Conway's rapid prototyping system - in what became know as the MOSIS system for internet-based remote access to quick turnaround chip fabrication. Relevant excerpts from Funding a Revolution follow below: Note that this book also describes the important parallel role of DARPA in the innovation of the internet. Taken together, the chip design revolution and the innovation of internet communication technology - both of which largely derived from DARPA research programs - provide much of the foundation of modern information and communications technology. Very Large Scale Integrated Circuits. Efforts to develop very large scale integrated circuit (VLSI) technology demonstrate the role DARPA played in the growing computing industry by identifying technological developments of interest to DOD and the industry as a whole and helping them reach a state of greater maturity. Pioneering work in VLSI was conducted in the mid-1970s by Carver Mead, a professor at the California Institute of Technology (CalTech) with interests in semiconductor technology, and Lynn Conway, an expert in computer architecture at Xerox PARC. Encouraged by Bert Sutherland, Conway's laboratory manager at Xerox, and Bert's brother, Ivan Sutherland, chair of computer science at CalTech, Mead and Conway developed a simplified, standardized system design methodology and layout design rules for VLSI system and circuit design. Their design methods allowed integrated circuit (IC) designers to more quickly and easily design new ICs. Conway also innovated a new form of network-based, fast-turnaround VLSI prototyping service at PARC. Called the MPC Implementation System, the service enabled chips designers at many locations around the country to submit design files over the ARPANET for low-cost, rapid fabrication. The MPC system became the basis of what was later called the Metal Oxide Silicon Implementation Service, or MOSIS. Mead and Conway propagated their new design methods and rules through courses they taught during 1978 and 1979, first Conway's course at MIT and then additional courses at other universities such as Stanford, University of California at Berkeley (UC-Berkeley), and CalTech, exploiting prepublication versions of their new textbook about the methods. In the fall of 1979, Conway and her group at Xerox PARC used the MPC system to provide rapid chip prototyping for student design projects at many universities. The success of the many MPC79 designs validated their methods and quickly led to more widespread use of their design methodology. Their book Introduction to VLSI Systems was published by Addison-Wesley in 1980 (Mead and Conway, 1980). The Mead-Conway approach also spurred development of a rich variety of computer designs as well as related supporting technologies for checking and testing designs, for graphics editors, and for simulators. The design methods and rules formed the basis of the specification language used in the MOSIS program and provided the essential ingredient for developing computer-aided design tools for VLSI layouts. The first such tool, ICARUS, resulted in 1976 from the work of Douglas Fairbairn at Xerox PARC and James Rowson at CalTech. This tool was used in VLSI design courses at Stanford and adopted by a number of researchers. James Clark, then an associate professor at Stanford University, used VLSI tools and techniques to develop a geometry engine for producing complex computer graphic images. In 1982, Clark founded Silicon Graphics, Inc., which commercialized the technology and subsequently became a leader in visual computing systems. DARPA's VLSI program built upon these early efforts. Formally initiated by Robert Kahn in 1978, the DARPA program grew out of a study it commissioned at RAND Corporation in 1976 to evaluate the scope of research DARPA might support in VLSI (Sutherland et al., 1976). The final report, written by Ivan Sutherland, Carver Mead, and Thomas Everhardt, concluded that continued attempts to increase computational power by packing more devices onto a single integrated circuit--as industry was attempting--ignored the possibility of even greater gains through wholly new computer architectures. As the report noted, the advancement of VLSI technologies required new paradigms for integrated circuit designs, because the circuit elements themselves would become cheap, but the interconnections between them would become more expensive. Sutherland and Mead published a derivative article in Scientific American in September 1977 to gain an even broader audience for their ideas (Sutherland and Mead, 1977). DARPA's plan for its VLSI program was to foster revolutionary advances by supporting university research and building bridges between research communities. To promote information sharing, DARPA maintained open, nonrestrictive policies on the publication of results, supported research with only indirect connections to military or defense applications, and refrained from classifying results. These principles stood in direct contrast to DOD's other main semiconductor initiative of the time, the Very High Speed Integrated Circuit (VHSIC) program, which tried to advance industrial practices in a more incremental fashion, required direct defense relevance, and had a number of restrictions in place on publication of results. DARPA played a strong role in identifying VLSI as an area for strategic direction but allowed much of the program content to emerge from the research community. Proposals were supported on the basis of their individual persuasiveness and the track record of the proposing institutions and principal investigators. Between 1978 and 1979, DARPA funded about a dozen programs in various aspects of VLSI technology at centers such as CalTech, Carnegie Mellon University, the Jet Propulsion Laboratory, MIT, Mississippi State University, University of North Carolina, Stanford University, UC-Berkeley, and the University of Utah. DARPA favored proposals drawn broadly to cover a range of related areas under the supervision of a single principal investigator. Many, if not most, of the participants were early adopters of the Mead-Conway design methods and thus had a common basis on which to build their research explorations. Management of DARPA's VLSI program was turned over to Duane Adams in 1980 and to Paul Losleben in 1981 after Adams was promoted to deputy director of IPTO. Losleben came from the National Security Agency and brought expertise in semiconductor processing technology. Under their direction, the VLSI program evolved into four major lines of research: (1) computer architecture and system design; (2) microelectronic device fabrication process; (3) education and human resource development in microelectronics and computer science; and (4) fast-turnaround design fabrication, testing, and evaluation. The program made numerous contributions in each of these areas (Box 4.4 describes some prominent examples) and contributed to the commercialization of several VLSI-based technologies (Table 4.2). Part of this success resulted from the close ties between research and educational initiatives, with experimental classes leading to technologies such as reduced instruction set computing (RISC) processors, and research feeding back into the education and training of students. On the technical side, the focus of the VLSI program expanded from attempts to accelerate development of submicron semiconductor devices to a broader set of improvements in computer capabilities based on submicron devices, with particular attention to computer design and architecture. DOD anticipated a range of uses for new-generation computers, including signal processing and interpretation, aerodynamic simulation, artificial intelligence, image and speech recognition, robotics, and high-performance graphics (Van Atta et al., 1991a). Research it supported led to a variety of new architectures that found acceptance both in DOD and in the commercial marketplace (Box 4.4). DARPA was by far the largest federal supporter of VLSI research. Its funding for the VLSI program grew from less than $15 million in 1979 to over $93 million in 1982. But other organizations also played critical roles in the success of the VLSI program. NSF assumed responsibility for MOSIS. Its main objective was to pursue educational applications of MOSIS, and it expanded the reach of the program to a wider set of academic institutions than DARPA had. ONR, too, funded several projects in VLSI but with much smaller grants than DARPA. ONR funds were often considered a "sandbox" for new ideas that, if successful, would merit subsequent DARPA funding. Similarly, industry contributed to university research. The Stanford Center for Integrated Systems, for example, attracted funding in small amounts from 11 to 12 companies. This money was generally used to support students and to fund faculty who were starting new research areas and who lacked the long track record needed to attract DARPA funding. Hence, while government research funding dwarfed industry contributions, industry funding was key for launching areas not mature enough to merit government support. Federal funding for VLSI began to decline in the mid-1980s. By 1983, plans for DARPA's Strategic Computing Initiative evolved to the point that the most promising ongoing architecture projects in the VLSI program (such as WARP, Butterfly, and Connection Machine) shifted to the new program. The VLSI program became increasingly focused on semiconductor devices. Main elements of the program included computer-aided design and manufacturing technology, test and evaluation tools, and implementation and testing technologies, including ongoing support for MOSIS. DARPA's Very Large Scale Integrated Circuit (VLSI) program supported research on a number of innovations that revolutionized computing and computing research. Work on computer workstations, reduced instruction set computing, and semiconductor fabrication services for university researchers, in particular, benefited from DARPA support. In each of these areas, DARPA identified ongoing research of interest and provided the support necessary to bring the work to fruition. Although industry efforts to develop computer workstations were under way at companies such as Apollo Computer, they received a significant boost from DARPA-sponsored research. DARPA supported the work of Forest Baskett, a specialist in computer architecture at Stanford University, who submitted a proposal to DARPA to create the Stanford University Network (SUN). As part of this effort, he planned to build a powerful single-user workstation, combining a 32-bit microprocessor (like Motorola's new 68000) and a wide-screen display. Baskett set Andreas Bechtolsheim to work on the hardware. He also interacted with James Clark, whose work on a high-speed graphics engine Baskett saw as critical to scientific and engineering applications of the system. The prototype SUN workstation was successfully demonstrated in 1981. DARPA and Stanford University encouraged Bechtolsheim to commercialize the workstation, which he originally did through a company called VLSI Systems, which was to produce the workstation boards for other computer manufacturers. After reviewing proposals from potential computer manufacturers and seeing Apollo announce its own workstation, however, Bechtolsheim realized he would have to move quickly and design his own machines. Key to his plan was using Unix, recently expanded by Bill Joy at UC-Berkeley under another DARPA VLSI contract to enhance its multitasking, multiuser, and networking capabilities. With help from Vinod Khosla and Scott McNealy (both Stanford University MBAs), Bechtolsheim was able to solicit Joy's participation and attract needed venture capital. The team established Sun Microsystems, Inc., in February 1982, and its first product was launched in 1983. DARPA extended funds to a number of academic institutions to allow them to purchase workstations for institutional users and networks. Such purchases accounted for 80 percent of Sun Microsystems' sales in its first year of business. Since then, Sun has become a major force in the computing industry as both a manufacturer of computer workstations and the developer of the Java programming language. Reduced instruction set computing (RISC) computers promised significant gains in performance by optimizing the flow of instructions through the processing unit. Although pioneering work on RISC architectures was conducted by IBM as part of its 801 computer, IBM did not move quickly to commercialize the technology for fear that it would detract from burgeoning sales of its mainframe computers; nor was such work well publicized, although its existence became known in academic research circles (Hennessy and Patterson, 1990). DARPA sponsored two university-based programs to develop RISC as a workable technology under VLSI: one, led by David Patterson at UC-Berkeley, developed the RISC I and RISC II architectures; the other, led by John Hennessy at Stanford University, resulted in the MIPS architecture. Both were general-purpose designs aimed at achieving more efficient interaction between computational, storage, and communications units within a device structure by employing pipelined architectures and processors closely linked with memory and communication circuits. Both designs were adopted rapidly by industry. The newly formed Sun Microsystems, Inc., licensed the RISC II architecture from the University of California and hired Patterson as a consultant to help develop the scalable processor architecture, a RISC-based design that it subsequently incorporated into its workstations. This technology enabled Sun to fend off growing competition from companies such as Digital Equipment Corporation, Hewlett-Packard, and Steve Jobs' NeXT Corporation, which were planning their own entries into the workstation market. Hennessy and his colleagues at Stanford University founded MIPS Computer Systems to commercialize their RISC architecture. The company licensed five major chip producers to produce devices based on the technology and five other companies to use the MIPS architecture in their own computers. MIPS Computer Systems was subsequently purchased by Silicon Graphics, Inc. (SGI), although SGI is currently spinning off the company. The VLSI program supported research on a number of innovative computer architectures other than RISC. Most of this work centered on designs for parallel computers. A range of projects supported a variety of configurations for linking microprocessors and memory, from the connection machine to the cube machines for general-purpose computing and the WARP architectures for special-purpose applications, such as signal processing. Several of these approaches were commercialized through start-up companies, such as Thinking Machines Corporation, or established firms, such as Intel Corporation. Although successful technologically, many of these designs failed to achieve commercial success. DARPA also worked to establish ongoing technical and human infrastructure for VLSI. Of note was establishment of the Metal Oxide Silicon Implementation Service (MOSIS). Based on the innovative MultiProject Chip (MPC) service created by Lynn Conway at Xerox PARC (Conway, 1981), MOSIS provided university researchers with a means of quickly manufacturing limited numbers of custom or semicustom microelectronic devices at reasonable cost. New designs could be implemented in silicon within 4 to 10 weeks (less than the duration of an academic term). Prior to MOSIS (and the original MPC service), academic researchers had few economical ways of implementing and testing new semiconductor designs, few universities could afford their own fabrication lines, and the proliferation of different commercial systems of rules for specifying semiconductor circuit designs--most of which were kept proprietary--made collaboration between universities and industry difficult. With MOSIS, researchers could submit designs for fabrication in a standardized format through the ARPANET or, subsequently, e-mail. Requests from different researchers were pooled into common lots and run through the fabrication process, after which completed chips were returned to the researchers. This system obviated the need for direct access to a fabrication line or for dealing with the complexity of arranging fabrication time at an industrial facility, by providing access to a qualified group of fabrication facilities through a single interface. MOSIS was widely used by the academic research community and contributed to many novel systems. Access to MOSIS was originally limited to the VLSI research community and other Department of Defense contractors who linked to it through the ARPANET. After the National Science Foundation (NSF) assumed responsibility for administering MOSIS in 1982, access was expanded to include NSF-sponsored researchers and affiliated educational institutions. In 1984, access was expanded to other qualified users as well. Altogether, MOSIS was used by researchers at more than 360 institutions by 1989. The number of projects run through MOSIS increased from 258 in 1981 to 1,880 in 1989. RISC-based designs, such as RISC I, RISC II, and MIPS, and the geometry engine later commercialized by SGI were all run through MOSIS during their early design and testing phases. Prominent VLSI researcher Charles Seitz commented that MOSIS represented the first period since the pioneering work of Eckert and Mauchley on the ENIAC in the late 1940s that universities and small companies had access to state-of-the-art digital technology. DARPA also supported development of tools for designing VLSI devices. In 1978 and 1979, DARPA funded development of a program for step-level improvement in the layout of microelectronic devices. The result was Caesar, an interactive VLSI layout editor that was written in C, enabling it to run on VAX computers using the Berkeley version of Unix developed by Bill Joy. Caesar produced CalTech intermediate form files for use with the MOSIS system and was used to develop the RISC I, RISC II, and MIPS designs. Further modification made the tool suitable for more widespread use. A later, more advanced design technology created at UC-Berkeley, Magic, became even more widely used and formed the basis for several computer-assisted design systems, including those by VLSI Technology, Cadence, Valid Logic, Daisy, Mentor Graphics, and Viewlogic. RISC I and RISC II David Patterson, UC-Berkeley SPARC, Sun Microsystems, Inc. Connection Machine Danny Hillis, MIT Thinking Machines, Inc.
Geometry Engine Jim Clark, Stanford University Silicon Graphics, Inc.
SUN (networked) Forest Baskett, Stanford University Sun Microsystems, Inc.
*Valid logic, Viewlogic, Mentor Graphics, Daisy, and Cadence all have products essentially based on the Magic concept.